How do you pay for solar energy if you don’t have a credit card or bank account? Thanks to Off Grid Electric, people in the developing world can pay as they go for installed solar power systems electricity the same way they top-up their phone minutes. 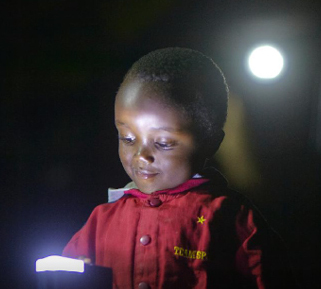 By replacing families’ inefficient, dangerous kerosene lamps with solar systems that can run modern lights, Off Grid is bringing the electrical revolution to countries still in the dark. While most people think of light as the most essential use of technology, Off Grid found the number one reason their customers sign up is because they want to charge their phones. Many residents of Tanzania where Off Grid operates don’t have outlets in their homes, and they can’t juice up an Android with kerosene. Like in other parts of the developing world, people have to hike to a nearby convenience store or business where someone will make them pay $0.25 to charge their phone, along with the inconvenience of having to leave it there. Without proper energy grids in remote areas, the only option for some families in Tanzania is solar. But the average income there is only about $700 a year. Combined with the lack of banking or credit, installed solar systems that run as high as $1000 are too expensive to buy up front. Even then the customer is taking on a lot of risk while they slowly recoup the cost through cheaper energy. That’s why Off Grid Electric took a cue from how people pay for mobile phone service in the region. “We’re a pioneer of micro-solar leasing” says Helgesen. That’s important, considering that since population grow has outpaced technological progress, there are more people without electricity now that when Thomas Edison lit the first lightbulb. Customers pay a small $6 installation fee, and Off Grid puts a self-sustaining solar system on their house, complete with panels, lithium battery, super-efficient lights, and a meter. The panels collect energy and store it in the battery. But to use it, the customer sends Off Grid a mobile payment and gets a passcode they can enter on the meter to unlock their energy. For about $5 to $10 a month, around equal or less than they pay for kerosene, Helgesen tells me Off Grid customers get “50X more light” plus the ability to charge their phone or power a television. They can’t run an energy-gobbling blender or toaster, but it all beats igniting jet fuel in your living room, which can lead to inhalation health problems or burns. The idea is that over a 10-year period, Off Grid will make back the money it invests by letting families pay for a solar system over time. Compared to competitors, Helgesen says “Our price feels much more like a utility bill.” And since it uses a bring your own phone model rather than putting a phone inside the meter itself like some solar installers, Off Grid can be cheaper, doesn’t need deal with the telecoms, and works even if a customer’s home doesn’t get cell reception. Helgesen tells me he met his co-founders and became obsessed with the idea of Off Grid while studying at Oxford on a scholarship to solve big world problems. Previously, Helgesen started Better World Books, one of the biggest used book resellers that he says now does $70 million in revenue. But people can’t read without light, so Helgesen moved to Tanzania to solve a higher-order problem through solar. The $16 million from previous investors SolarCity, Microsoft co-founder Paul Allen’s Vulcan Capital, and UK-based Zouk Capital, Off Grid plans to expand its installation workforce while improving its hardware and software. The startup even runs its own vocational schools to teach locals how to be solar installation technicians. The company is vertically integrated, doing everything but the manufacturing of the solar panels. It stands to profit by smoothing the signup, installation, metering, and payment process as it drives towards its next milestone of 100,000 customers. There’s huge potential, as there are 8 million homes without electricity in Tanzania and another 8 million right across the border in Kenya. The model could scale to the entire developing world. Off Grid says it hopes its long-term payback strategy will help it out-compete others in the space like MobiSol and SolarNow where people pay more up front. The new equity funding could also instill confidence in big banks that Off Grid is tapping to finance the installations.